The Biodex Gait Trainer™ 3 is more than a treadmill. It is designed with an instrumented deck that issues both audio cueing and visual biofeedback to prompt patients into their correct gait pattern. Step length, step speed and right-to-left time distribution (step symmetry) are directly addressed; patient footfall is compared to desired footfall step after step, both on the display in real time and documented in an easy to read histogram. 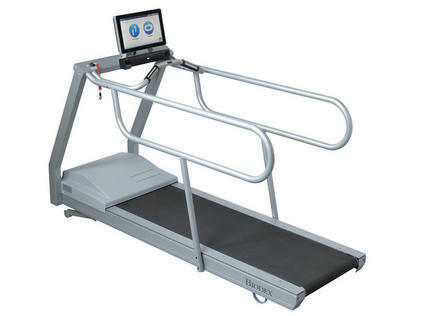 The Biodex Gait Trainer is quiet, non-intimidating and allows the therapist to get in there and treat their patients. Real goals are monitored and progress is reported. Objective documentation, with comparison to age- and gender-based normative data, helps prove need and document outcomes to family, referring physicians and insurance providers. 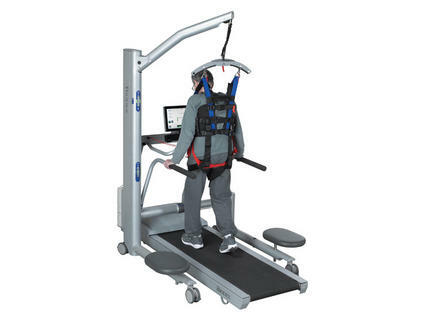 Beyond the many features and applications for gait training, this dual mode device can also be used as a traditional rehabilitation treadmill with speed range up to 10 mph. 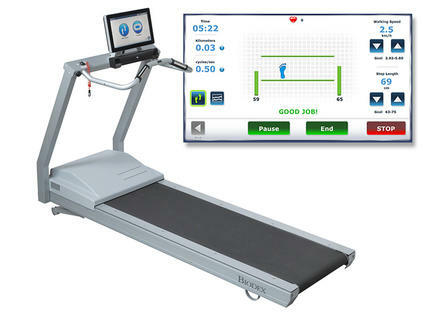 The Gait Trainer provides audio cueing and visual biofeedback of step length and step speed. The NxStep Unweighing System provides partial body-weight support, helping patients regain their confidence, their strength and their stride. The Unweighing System, combined with the Gait Trainer 3, allows every patient the opportunity to get an early start on rehabilitation. 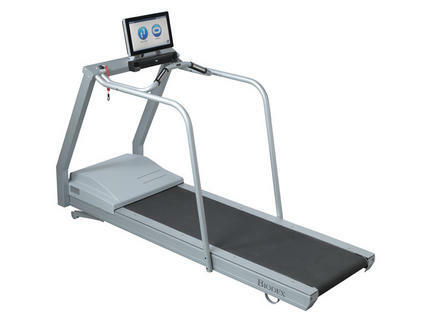 Instrumented Deck – the Gait Trainer™ 3 is the only treadmill with an instrumented deck that monitors and records step length, step speed and right-to-left time distribution (step symmetry). Open Platform – enables patient access for therapist interaction; easily accommodates BWSTT with the Biodex Unweighing System. NEW Software and Larger Display – intuitive navigation, 15.6" touchscreen display for improved user experience. Also accommodates external keyboard and a mouse. Audio Cueing and Visual Biofeedback – motivates patients with metronome and biofeedback of footfall, prompting proper gait patterns. Cueing and biofeedback help patients stay on target in each phase of rehabilitation. NEW Music-Assisted Therapy Package – Rhythmic Auditory Cueing (RAC) is available with optional music therapy-informed compositions. High-quality recordings use specific musical components and correct beats per minute to facilitate correct movements of gait. Results of music-supported therapy can be documented. NEW Microsoft SQL Database – allows clinician to easily store and retrieve patient data, multiple tests per patient. Export to Excel® for reporting and analytics. Objective Documentation – lets you quantify patient progress and demonstrate the benefits of treatment. Biodex technology helps accelerate positive patient outcomes, and then lets you prove it. Enhanced Normative Data – robust base of healthy population by age and gender for comparative patient assessment. Heart Rate Monitoring – Polar® contact hand grips (telemetry compatible) ensures proper training intensity. Connect & Engage – system allows connection to larger monitors and projectors to enhance interaction for visually impaired patients. All test results and training sessions can be stored and printed. Comparison to normative data helps communicate need, progress and outcome. Goal: Develop symmetrical gait by improving step length, step speed and right to left time distribution. Have the patient walk at a comfortable step speed concentrating on symmetry of step length and step time. Once the patient has developed symmetry and cardiovascular gains, begin to work towards normative gait parameters. As an option, support the patient in the Biodex Unweighing System to provide a no-fall environment. Improved patient confidence with associated improvements of strength, balance and endurance. Excellent for older adults to perform physical conditioning exercises associated with rehabilitation or fall prevention program. Efficient and safe use of clinician time. Allows concentration on treatment, not physically supporting the patient. American Geriatrics Society, British Geriatrics Society and American Academy of Orthopedic Surgeons Panel on Falls Prevention, Guideline for the Prevention of Falls in Older Persons, April 5, 2001. Simpson JM, Harrington R, Marsh N., Guidelines for Managing Falls Among Elderly People. Physiotherapy, 84:4;173-177 April 1998. Utilize audio cues and biofeedback to develop step length symmetry and right to left time distribution. Initially support patient's body weight using the Biodex Unweighing System. Set treadmill belt in reverse direction (retro-walking) to assist with gains in range of motion. Forward direction of belt works on symmetry of step length and step time. Initiate rehabilitation earlier following joint sprains, surgical repair or replacement. Gains in range of motion, gait parameters, strength and endurance. Effective, efficient and safe use of clinician time. Open access design of the Unweighing System allows hands-on interaction with the patient during gait training. Improved proprioception and acceptance for weight bearing activity. Progressively address step speed and right to left time distribution. Use a slow initial belt speed (.10 cycles/sec - .50 cycles/sec). Clinician may assist with paretic limb placement to initiate step length. Visual cues are used initially to reinforce step length. Once step symmetry is reached, gait speed can be addressed. The Gait Trainer forces the patient to focus on foot placement, which is reinforced through visual cues on the display. Improved right to left time distribution and increased step time during ambulation is achieved in an upright and fully supported position through repetitive and rhythmic movements. Treadmill training effects are readily transferred to improved over ground walking speed and endurance. Rehabilitation can commence earlier as the Unweighing System provides a safe environment for both the patient and the clinician. Suzuki et al., Determinants and predictors of the maximum walking speed during computer assisted gait training in hemiparetic stroke patients. Suzuki et al., Relationship between stride length and walking rate in gait training for hemiparetic stroke patients. Initially, concentrate on developing step length symmetry. Once symmetry is achieved, increase speed of the treadmill for progression towards normative gait parameters specific to the age, gender and leg length of the patient. Sensory input from the rhythmic treadmill belt movement assists with patterning of the central nervous system. Improved right to left time distribution and increased step cycles/sec during ambulation is achieved in an upright and fully supported position through repetitive and rhythmic movements. Suzuki et al., Determinants and predictors of the maximum walking speed during computer assisted gait training in hemi paretic stroke patients. Suzuki et al., Relationship between stride length and walking rate in gait training for hemi paretic stroke patients. Using audio and visual cues, initially concentrate on developing step length symmetry with focus on right to left time distribution. Once symmetry is achieved, increase speed of the treadmill for progression towards normative gait parameters specific of the age, gender and leg length of the patient. The Gait Trainer forces the patient to focus on foot placement symmetry, which is reinforced through visual cues on the display. Efficient gait pattern with step length symmetry and improve right to left time distribution will reduce the metabolic demands associated with prosthetic gait. Goals can be set through comparison of the uninvolved and involved limbs performance measures. Peterson et al., Physiological responses during unweighted ambulation of three patients with below the knee amputation: A pilot study. Utilize audio and visual cues to assist the retraining of the temporal and spatial deficits associated with Parkinsonian Gait. The patient focuses on the visual and audio cues, which help to regulate step length. Improvement of step length and step time. Improvement of muscular strength and endurance and overall cardiovascular tolerance for physical activity. Improved step symmetry and increased step time during ambulation is achieved in an upright and fully supported position through repetitive and rhythmic movements. Treadmill training effects are readily transferred to improved overground walking speed and endurance. 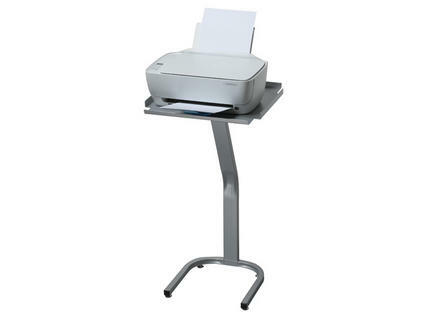 All-In-One Flat Panel PC: 15.6" Color Touchscreen, Windows Operating System, Ethernet, USB, Video/Audio Out, Built-In Speakers and Color Printer. Bolsters connectivity options to other devices, enabling remote operation for data transfer and software upgrades. Power: 115 VAC, 50/60 Hz, 20 AMP dedicated line, or 230 VAC, 50/60 Hz, 20 AMP dedicated line. Includes hospital grade plug with 12' (3.7 m) power cord. Certification: ETL listed to UL 60601-1 and CAN/CSA C22.2 No.:601.1.M90. CE conformity to EN 60601-1, EMC compliance to EN 60601-1-2. *Does not accommodate less than 60 lb in gait trainer mode. Because you believe in better patient outcomes, Biodex brings the Music-Assisted Therapy option to the Gait Trainer 3. Music-based therapy is well researched for its powerful effects in treatment of movement disorders. With the rate of Parkinson’s, stroke and cerebral palsy diagnoses on the rise, so is the need for better treatment options. We equipped the Gait Trainer 3 with informed compositions written and performed by music therapists to revolutionize gait therapy. The right music, biofeedback and repetition help reinforce neuroplasticity and get patients better, faster. Documented. 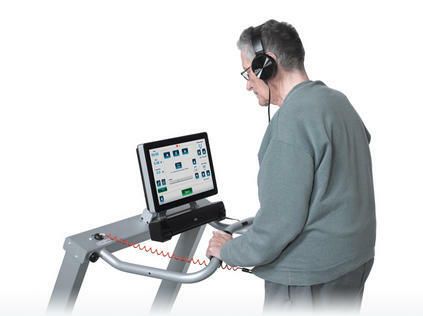 Click here for more information about Music-Assisted Therapy for the Gait Trainer 3. Compatible with Gait Trainer 3 featuring Windows OS. Includes music library and sound bar with input for headphones and microphone. Corporate partners of ICAA will present balance and mobility exercise devices to fuel wellness offerings for baby boomers.